Why is this table so special to Berks County’s unique history? The “Stammtisch” was a centerpiece of the “Tafelrunde auf Kuechler’s Roost,” a club of German businessmen who met regularly at Kuechler’s Roost on Mt. Penn. Jacob Kuechler, pictured in the painting hanging above the table, was known as the ‘hermit of the mountain’. He was a spirited character who lived on Mt. Penn on what is now List Road. His “Roost” was one of many stops along the Gravity Railroad where crowds would gather to enjoy delicious fare and libations. The table and chairs were designed and executed by Robert Carl Braun and were produced at Louis Heilbron’s furniture store and factory at 940 Penn Street. The table was saved when the Roost was destroyed by fire on July 4, 1919 and is now on display in the BHC Museum. The most frequent question I get is: How can I preserve and save my family documents. I will often ask questions to try and figure out the current condition to make recommendations. My basic recommendations are: 1. Unfold the documents and store flat. Documents tear along fold lines. Unfolding these documents, will take the stress off of the fold. 2. Do not store archival material in direct sunlight. The UV light will cause the documents and photographs to fade. 3. Do not store artwork, documents or photographs on outside walls. Outside walls have the most contact with outdoor temperature fluctuations and will expand and contract depending on the weather conditions, causing your material to expand and contract. 4. Do not store your documents in attics or basements, because of the lack of control over temperature and humidity and risk of flooding. Too much humidity can cause mold growth and too little humidity can make archival material brittle. Both accelerate the deterioration of archival material. 5. If your documents are rolled and maintain their tube-like shape, do not unroll them. Unrolling them will cause them to break at stress points along the roll. The documents will need to be humidified and once relaxed, can then be viewed. This is a rolled document before humidification. You can see where the document has started to tear along the roll. You can also see where the donor, at one point, tried to tape the tears to keep the document from breaking. Please do not tape your documents. The adhesive will add to the deterioration of the document. This photograph has broken apart along the fold and is now in multiple pieces. Curiosity got the best of the donor of this image. When the first section broke off, he continued to unroll the image to see it in its entirety. As a result, the image is in multiple pieces and cannot be put back together. When I started working here, I made the recommendation that documents could be humidified in a steamy bathroom. After a couple of long hot showers, the documents would begin to relax and then could be better handled. I made that recommendation, because I had tested it in my bathroom when I was living in New York. It worked great; until this past winter. The Henry Janssen Library is climate controlled, up to a certain point. During the winter the boiler is turned on and, in theory, I should be able to build up humidity in our humidifier. We use the double garbage can method, with distilled water. However, this past winter, nothing I did could get enough humidity into the chamber to humidify some tightly rolled documents. As a last resort, I took them home to use my trusty bathroom method. The bathroom humidification chamber didn’t work and I ended up bring the HJL’s humidification system home and finished the project. I learned that the effectiveness of building up enough humidity in a bathroom, in order to hydrate documents is determined by the size of the bathroom. My bathroom in Gibraltar is twice the size of my old one in New York and has a window. Since the room is larger, it takes more steam to fill and less time for that steam to dissipate than in a smaller more compact space. The documents were not getting enough time to soak in the moisture. I forgot history preservation is also about physics. In an ideal setting, including the Henry Janssen Library, all archival material would be stored in an area lower than 68 degrees Fahrenheit with humidity between 30-50% with very little fluctuation. Unfortunately, the recommended storage conditions are not the ideal living (or researching) conditions. Fortunately for the “Do-It-Yourselfers” following the recommendations above will set you on the track toward preservation. For more information on how you can humidify your documents, please check out this article “Practical Considerations for Humidifying and Flattening Paper” by Stephanie Watkins, found at: http://cool.conservation-us.org/coolaic/sg/bpg/annual/v21/bp21-15.pdf, or other resources through Google. 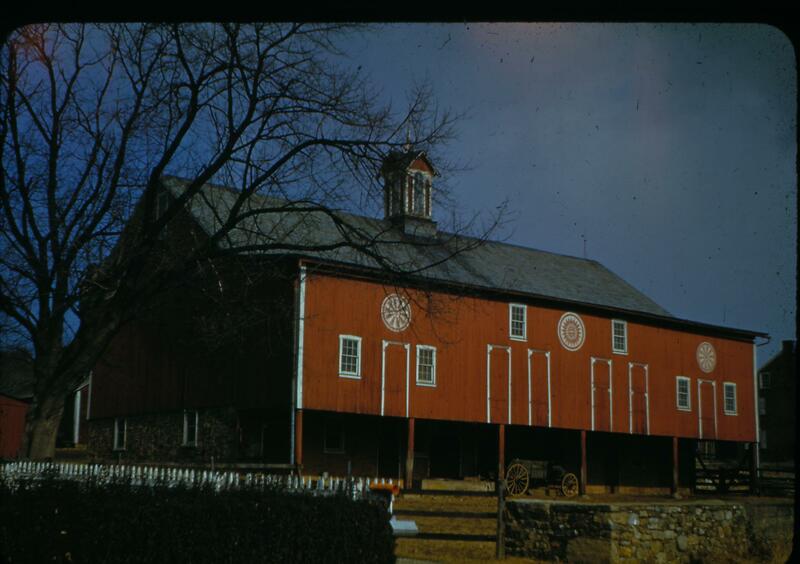 These barns, also known as bank barns, often had multiple stories and sometimes built into the side of a bank, which assisted in accessing the multiple levels. These structures usually had a stone foundation with upper sections made of wood. As harvests grew and more income earned, a stone house replaced the rough log, or wooden house, additional buildings were added, and more land acquired. “The Humble petition of ye Inhabitants of Maxaton to ye Hounourable the Justices of ye Court of Quarter Sessions held at Philada. ye 4th day of June 1742. Humbley Sheweth: Whereas your Petitioners have been settled in those parts of this county for near twenty years past and have for several years paid our Taxes and County levies as well as some other of our Neighbours, But now being grown more popolus we find a Necessity to bring our Selves under your further notice and Protection. The second reference book (my personal favorite) is entitled: Early Landowners of Pennsylvania: Atlas of Township Warrantee Maps of Berks County, PA, by Dr. Sharon MacInnes, 2006. The Warrant Maps describe how the original land tracts were situated and who owned them. We have these maps in the library and they usually span an entire table. To the right, is the Warrant Map for Robeson Township. 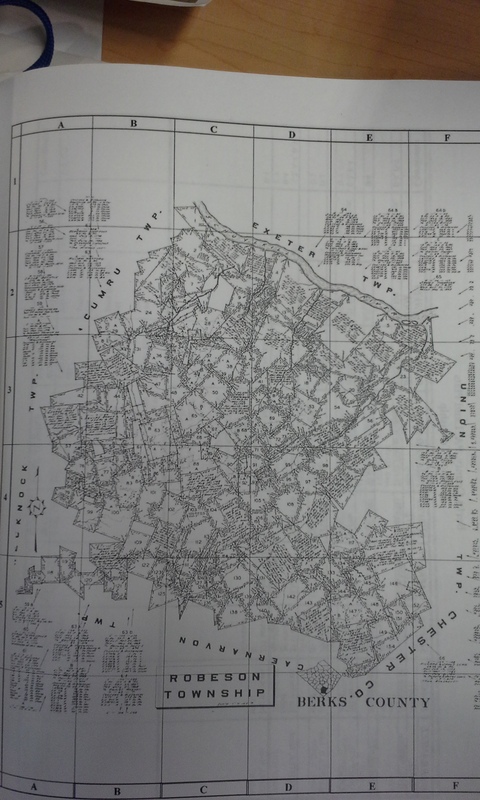 Each tract is numbered and around the edges of the map are the corresponding numbers, with the Name of the owner, the acreage, and dates for the warrant, survey and patent. Some other information might be included. The Warrants are important, because it is the starting point of land ownership in the county. We like to think that our ancestors took the Schuylkill Expressway to 422 and onto other routes, roads and highways, because we are trying to find a connection to them. We easily forget that our ancestors created what we see today.